Enjoy the fun, food and freedom of the open seas with the Carnival Spirit, the cruise ship that offers something for everyone. The Carnival Spirit cruise ship will offer you some of the best experiences on the sea, no matter what your taste is. For the thrill seeker there's the “Waterworks” - the largest waterpark at sea in Australia. If your style is a little more laid back you can enjoy the “Serenity” adult-only retreat or “Dive-in Movies”, where you can watch the most recent blockbusters while relaxing in the pool. To satisfy your hunger the Carnival Spirit can offer you ‘Guy's Burger Joint’ by celebrity chef Guy Fieri, “Fat Jimmy's C-side BBQ” and for the taste of the ocean, “Freshies Corner”. Once the sun goes down you can find some night time fun in one of the ship's various bars, enjoying the chilled out vibes of the “Redfrog Pub” or singing the night away in the Piano bar. For family fun, Hasbro, ‘The Game Show’ brings all the family favourite board games to life and the stage shows and playlist productions are guaranteed to keep everyone entertained. As with all of the Carnival Cruises fleet, the Carnival Spirit will always leave you with a smile on your face. 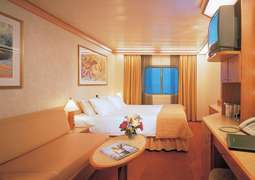 The cabins on the Carnival Spirit are known for their tremendous comfort and beautiful design. Feel free to choose between Inside Cabins, cabins with an ocean view or balcony and luxury Suites. Warm hospitality and cosiness await you. Every cabin provides 24-hour room service. On board the Carnival Spirit you will always dine in a wonderful atmosphere, whatever type of culinary experience you desire. Dine in the high-class Nouveau Restaurant. Guy's Burger Joint will serve you up burgers that everyone will enjoy and Bonsai Sushi is sure to be a hit with sushi lovers. There are plenty of places to enjoy a drink on board, whether you want to enjoy a relaxed atmosphere in the island-inspired RedFrog Rum Bar, try some new cocktails made by the mixologists in the Alchemy Bar or dance the night away in the onboard nigthclub. The Carnival Spirit offers a plethora of entertainment options and activities to keep you happy day and night. There is a wide variety of live music on board from laid-back island rock at the RedFrog Rum Bar to sing-a-longs long into the night at the Piano Bar. An entertaining children’s programme is offered for younger guests and teens are welcome to hang out have parties, play video games and much more in Club 02. You are also invited to dress to the nines for the Captain's Dinner, Gala Evening and for the Farewell Party. In a 2018 refurbishment, a brand new entertainment area for teenagers - the Warehouse Arcade was added, along with an arts and crafts space and state-of-the-art duty free store. Pamper yourself with some ultimate relaxation in the jacuzzi, sauna or steam bath, or take advantage of diverse massage treatments, facials and more in the Spa Carnival. Enjoy a peaceful child-free zone in the Serenity Retreat, where you can soak up the sunshine while enjoying a delicious cocktail in a tranquil setting. 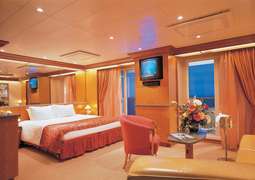 This is the floating resort that ushered in the Spirit-class ships with innovations such as the two-level promenade and the reservations-only supper club. She is nearly the length of three football fields and stands twelve decks tall – that’s a lot of ship! 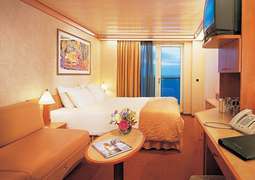 Her greater speed — and the fact that eighty percent of her cabins are outward-facing, and of those, the majority have balconies — make Carnival Spirit the perfect ship for special or longer vacations. Carnival Spirit’s interior decoration really is something else. Many different cultures are reflected around the ship in Carnival Spirit’s different lounges, restaurants and show venues. Some of the notable 6 onboard bars and lounges are: the deep red Oriental-themed bar, with its pagoda-style ceiling and delicate woodwork lattices, the sports bar with its seats and tables camouflaged as different types of sporting balls, the Egyptian lounge with a piano for a bar, and then the chintzy piano bars with marble furnishings, grandiose sweeping staircases and plush leather seats. Some rooms also allude to African climates, with bamboo chairs and walls, palm leaf ceilings, and 3D depictions of African wildlife jutting out from the walls. The Egyptian-themed theatre is also spectacular, with its gigantic sarcophaguses lining the walls and traditional embellishments. One thing is for certain on the Carnival Spirit – every room you walk into will demand your attention for one reason or another. Many amazing activities and amenities as well as great dining options to satisfy every member of the family. There are youth programs for the young ones, and an onboard golf program, the Spa Carnival, and a casino for the adults. Oh, and don’t forget Carnival’s famous club amenities; Carnival is well known for being a fun-loving cruise line! As well as dancing to the beats, you can listen to live music all night and all day, if you so desire. With karaoke, sing-alongs, and excellent live rock music in the RedFrog Pub, there is something for every type of music lover. In 2012 Carnival Spirit was fitted with the latest Waterpark at Sea, and it now boasts four swimming pools, four whirlpools, a padded jogging deck, a fitness centre with yoga, spinning and treadmills. And for thrill-seekers, the steepest waterslide on the seven seas, the Green Thunder waterslide, is a must-try! You can also spend an afternoon browsing the Fun Shops, playing at the 9-hole mini-golf course, or having fun in the Techno Arcade. Carnival Spirit’s homeport is Sydney, from where it travels around Australia, New Zealand, and the South Pacific. Get in touch with our expert CruiseAway agents to find out more!